It feels like either we just got here yesterday or we’ve been here for six months. But it’s neither—time is a good Anansi like that. Or maybe not Anansi, but something more sinister. A real thief of too-much, this mythical creature called “time.” Time has been the big subject of all I’ve been working on here—revising a book project, putting the finishing touches on another, working on new essays, new poems. The pain of time, the problem of beauty, the problem of representation itself. I’m also developing a crick in my neck from listening to D’Angelo’s new genius joint—his first album in 14 years. Or maybe is just chikungunya. In addition to being a trusty assistant for Kara’s Repositioned Objects installations, I had the pleasure of teaching two workshops at Fresh Milk on “The Art of the Essay/The Essay on Art.” I always try to cultivate a kind of community of ideas when I teach. But this was different; we had that and something else. After all, this wasn’t a classroom—it was a dairy farm, in the open air, with life happening regardless. So whether or not the cows, roosters, key lime-coloured lizards, secretish rats, vicious mosquitoes and welcome committee of dogs were also doing the writing exercises, I can’t be too sure. But some of them were certainly participating in the discussion. My workshoppers were very timid at first, terrified even, and then, gradually, open, courageous, brilliant and deeply honest. We were working on the “essay,” which means “to try,” but we were also working on transgression, “creolization” (of forms), translation, and, as always, freedom. I challenged them in big ways to completely re-think “criticism” and they responded by testing their own limits, taking risks and beginning to slay the demon of doubt. Most of them (maybe all) are millenials—anxious, lost, savvy, luminous and seriously talented. I’m very inspired by Tristan Alleyne, Khalid Batson, Kaz Fields, Versia Harris, Amanda Haynes, Katherine Kennedy, and Kwame Slusher. We landed in Barbados just before Independence Day and I could see my students (and myself) very clearly as the afterlives of Independence—its gains and its many, many failures. 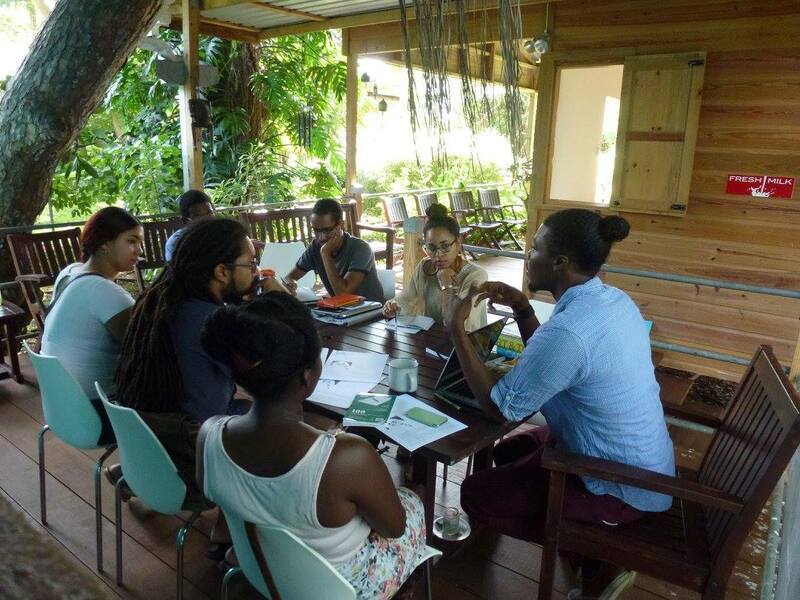 They were pretty clear about the ways they don’t fit into prevailing paradigms in “Caribbean” literature and culture. Teaching them also forced me to confront my own doubts and fears, my own need to be far more courageous. All of them are all over social media and tech-savvy. I’ve been thinking about the ways I’m a bit old-fashioned about my relationship to technology as an artist and critic. I see this project as a way to honour Carter through “Shango Electric” (to reference David Rudder), new technology; to be possessed by his words; to test my endurance and commitment; to create a ritual of renewal. After my first post, I learned that I should record on garageband for better sound, then upload to soundcloud and finally upload to my Facebook page. Each recording archives my thanks to him and the ghost of his voice through mine, as well as the traces of my life at a given time—the hoarseness of my voice in the morning, the tiredness of my voice at night, the vocalizing choices I make in relation to the text, the sounds of the world all around me. My poem-choices spring from a range of urges, sometimes to comment anew on the events of the globe and sometimes to comment on my interior. Gratitude to D’Angelo, my students and Martin Carter for reminding me that you can always begin again.